Just before the fall of Singapore in February 1942 a substantial number of British forces personnel escaped to Java where others joined them from Sumatra and from the UK, sent too late for the defence of Malaya. When the Dutch capitulated there on March 8th 1942 they were all taken prisoner. 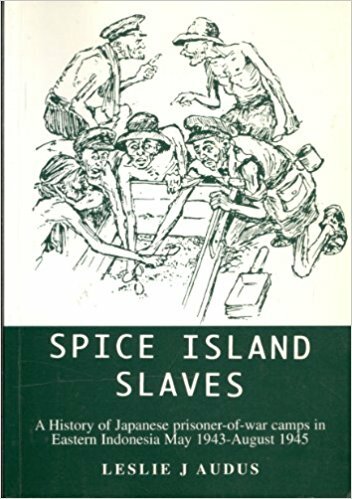 The fate of some of those men who were sent in May 1943 to camps in the Moluccan Archipelago (The Spice Islands) to build airfields for an assault on Australia, has been little publicised in the past, Their story is told in this book. It comprises chronological accounts of four camps compiled from contemporary diaries and records from a large number of British and Dutch sources structured largely on the authorís own history. It is illustrated by drawings of camp activities and caricatures of personalities made at the time; detailed maps, camp layouts and camp statistics are included. In those slave-labour camps at PELAU on the island of HARUKU, at LIANG on the island of AMBON and at AMAHAI on the island of CERAM (now spelled Seram or Serang) and during the final disastrous attempts to return the survivors to Java, including the terrible transit camp at RAHA on the island of MUNA at the south-east corner of Sulawesi, almost half of the 4110 service men (2827 British and 1283 Dutch) were to die from starvation, disease, brutal thrashings, execution and drownings. The multiplicity of sources ensure that there are no significant gaps in the story traced from the assembly of the drafts in Java to the final piecemeal return of the living skeletons of survivors during the last year of the war.